America’s CEO/Dictator, Donald Trump, recently make a big deal that the Clemson national championship football team was making a visit to the White House. So did billionaire Trump break out the bucks to entertain these athletic lads with a fine dining experience? In true Trumpian fashion, he treated them to piles and piles of hamburgers and other junk foods from fast food chains. We guess he just assumed that since he loves this crap, everybody else must do it as well. Trump also glaringly lied about the numbers served saying one time 300 hamburgers were served. Then he tweeted hilariously that a 1000 ‘hamberders’ were served. So if Trump isn’t lying, he’s misspelling…hugely. There’s that old adage that says “You are what you eat.” Well apparently, Trump is a pile of junk food. 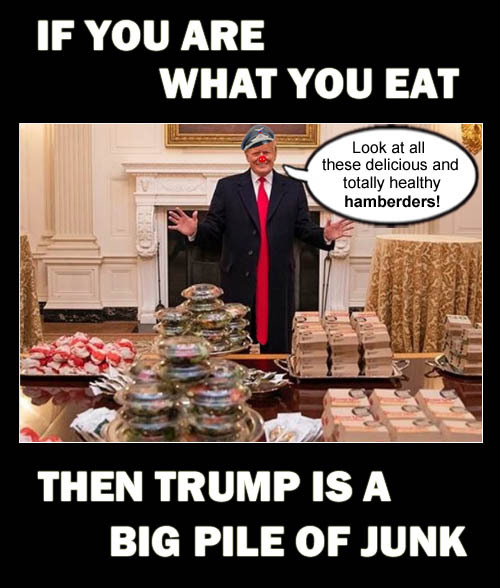 America’s CEO/Dictator and junk food and ‘hamberder’ aficionado, Donald Trump, proves that you are what you eat.